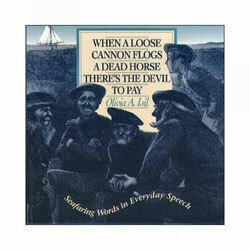 When a Loose Cannon Flogs a Dead Horse There's the Devil to Pay: Seafaring Words in Everyday Speech is a salty collection of over 250 words, phrases and sayings that have become common in English usage. Have you ever wondered about the origin of "son of a gun" or "flotsam and jetsam" or "hunky-dory"? It's Davy Jones' locker I'm talking about.